Location: The Return of Awethur. Once you have had the shield as your no-drop at least once, you can visit Valencia grumbugly and semi-permanently swap it for 20 Z-Tokens. You take -(5/1.4)% damage as a Mastercraft bonus. 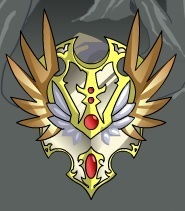 This shield is from the regalia of King Awethur! You can change its elements in the Guardian Tower and its defenses increase with your level! Stat info thanks to In Media Res. Updated stats thanks to Kamui. Old image and description thanks to ArchMagus Orodalf. New image thanks to Rayimika. Write-up thanks to Ello. June 29, 2011: The shield was released. August 17, 2018: The shield was updated. See revision for older stats. Location: Visit Valencia grumbugly. 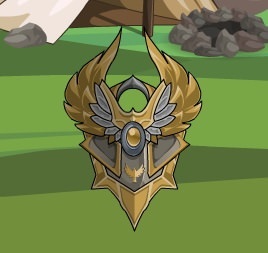 You need to have completed the Awe quests in order to get this shield.